Make sure to have warm cloths with you. 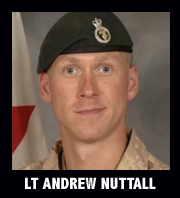 Lieutenant Andrew Richard Nuttall, 30, from the 1st Battalion Princess Patricia’s Canadian Light Infantry (1 PPCLI), based in Edmonton, Alberta, serving as a member of the 1 PPCLI Battle Group was killed by an improvised explosive device that detonated during a joint foot patrol near the village of Nakhonay in Panjwaii District, about 25 km southwest of Kandahar City on December 23, 2009. He is survived by his parents, Richard and Ethel Jane Nuttall. Staggered Feet Good Mornings x 6-8 ea.